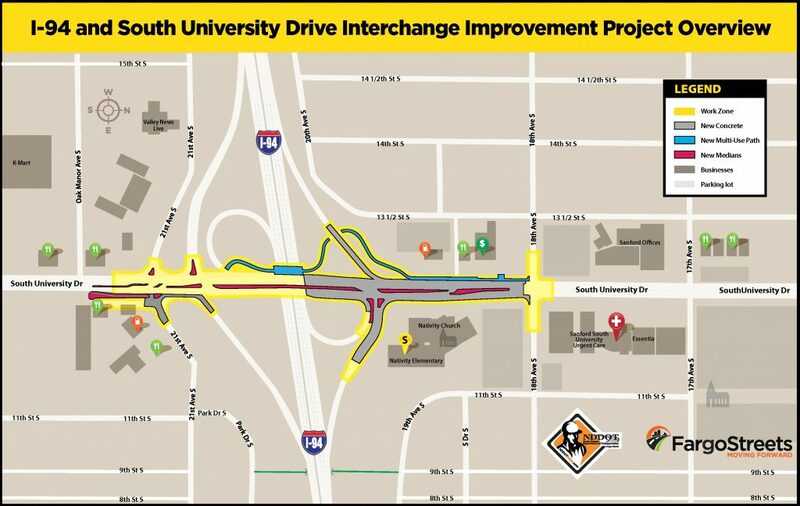 As project work nears completion on the summer-long North Dakota Department of Transportation (NDDOT) Fargo District and City of Fargo Interstate 94 (I-94) and South University Drive interchange reconstruction, a series of short-term traffic control changes or shifts in open driving lanes will occur over the next week. The shifts in traffic will allow additional room for crews to complete final project work before the full roadway opens to Fargo area drivers. Motorists are urged to stay attentive, drive with caution, and slow down. The work zone will be change day-to-day over the week. Starting tonight, around 6:30 p.m., crews will reduce southbound traffic to one driving lane between 18th Avenue South to north of the westbound interstate on-ramp. Work to install the permanent overhead sign truss for interstate traffic could last up to three hours. Two lanes of traffic will open to southbound traffic as soon as work is complete this evening. On Friday, October 5, after the morning rush hour traffic, crews will reduce the northbound traffic from two to one open driving lane to complete concrete work underneath the I-94 bridge. Traffic will use the median driving lane on South University Drive from about 21st Avenue South to underneath the interstate bridge. Traffic will flow back into two open driving lanes north of the bridge through the project limits. Weather permitting, Monday, October 8, two driving lanes will be open to northbound drivers again throughout the entire work zone. As the final improvement project work is wrapping up, additional driving lanes and pedestrian paths will open over the next week. The west side of the project carrying southbound traffic is anticipated to be the first section of roadway to fully open in the coming days. The east side for northbound traffic will continue to navigate traffic control until early next week. Following the opening of the full six-lanes of University Drive will be the new westbound I-94 on-ramp, new pedestrian shared-use paths and sidewalk through the full project limits. All the construction crews and contractors thank you again for your patience throughout the final phases of work.